Recently my husband Luis found a Facebook page dedicated to puertorican caricaturists, each week there’s an open caricature competition. At the end of the week people vote for their favorite and the winner gets to pick the next local celebrity to be drawn the next week. Luis has been really dedicated this past weeks participating, but I wasn’t able to do it until now… also I wasn’t so confident, so I spent some time reviewing the Facebook page, internet sites, some books and of course watching him do his own. Finally today I decided to dedicate the day to my first attempt. 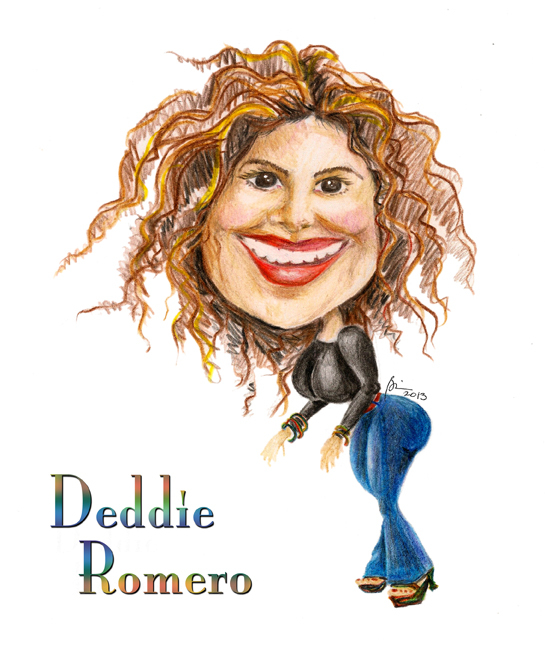 This week selection is Deddie Romero, a puertorican singer. First I looked up on the internet for many photos of her… the idea was to identify her recurrent expressions and to observe her particular features. I started sketching loosely her head and facial features, then the body. Then I scanned the drawing and scaled it to fit in the paper size I wanted to use, added the lettering -I decided to use a computer font so it wouldn’t distract from the actual drawing- then I printed the original sketch very light on a cardstock and then proceeded to work over it with colored pencils. I am really proud of my work and enjoyed the process a lot.